New Rochelle, NY, Aug. 3, 2018–A better understanding of the role secreted inflammatory cytokines play in the tumor microenvironment that results in the differentiation of effector T cells into exhausted T cells points to possible approaches to improve the antitumor activity of T cells and to intervene in T cell exhaustion. A new article exploring the expression patterns of inflammatory cytokines in tumor tissues and the blood of cancer patients and seeking to understand how exhausted T cells lose their antitumor properties is published in Cancer Biotherapy and Radiopharmaceuticals, a peer-reviewed journal from Mary Ann Liebert, Inc., publishers . The article is available free on the Cancer Biotherapy and Radiopharmaceuticals website through September 3, 2018. Cancer Biotherapy and Radiopharmaceuticals ," published 10 times per year in print and online, is the only peer-reviewed journal with a specific focus on cancer biotherapy, including monoclonal antibodies, cytokine therapy, cancer gene therapy, cell-based therapies, and other forms of immunotherapy. 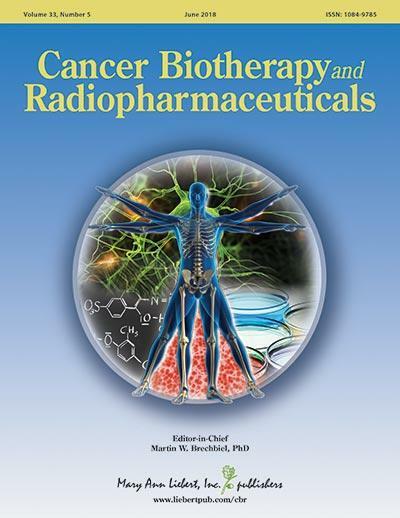 Led by Editor-in-Chief Martin W. Brechbiel, PhD, the Journal includes extensive reporting on advancements in radioimmunotherapy and the use of radiopharmaceuticals and radiolabeled peptides for the development of new cancer treatments. Tables of content and a sample issue can be viewed on the Cancer Biotherapy and Radiopharmaceuticals website.